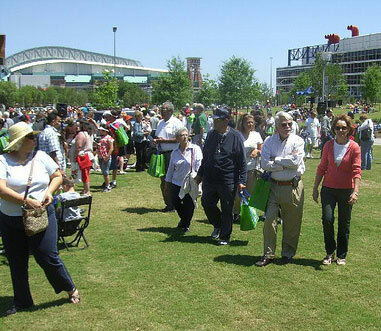 Thousands of revelers and recreation seekers came out for the opening of downtown Houston's first park, Discovery Green. The new 12-acre park boasts an interactive water feature, amphitheater, children's playground, dog run, spacious green lawns, public art works and restaurants. All the amenities are meant to draw a diversity of users. That was clearly accomplished on opening day. "It was a picture perfect day, and something over 20,000 people showed up. . . there are so many things to do in the park. It was really a lot of fun. . . we have had scores of parents with toddlers playing on the playground and kids throwing frisbees and sunbathing. Barbara Bush even stopped by." More information about the park can be found on the Discovery Green website.